Last weekend was beautiful here. This weekend looks to be cool and chilly with a good chance of rain. I’m grateful for the sun we did get, but I’m ready for more! On the warmest, most beautiful day last week, I decided it was time to move away from the carb-y comfort I’d been instinctively reaching for in favor of something lighter. 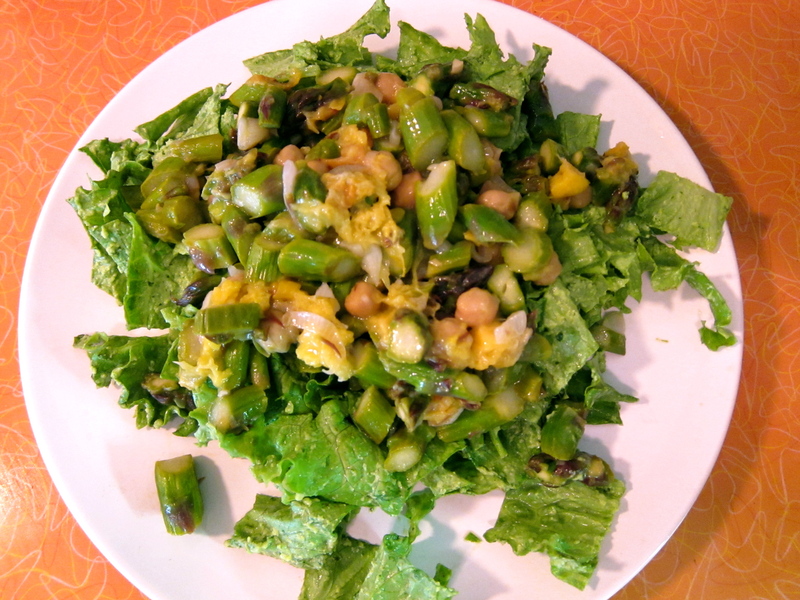 Hence the Portland Porch Salad. Which I did eat on my porch. Check out my cool countertops. It was inspired by lettuce wraps of the same name from the Post Punk Kitchen but mine quickly turned into a salad when I realized that I never have and never will be able to gracefully eat a lettuce wrap. Maybe I’m using the wrong king of lettuce or maybe I just get greedy and overload the poor leaves with filling. Whatever the reason, I’m much happier heaping everything onto a plate, grabbing a fork, and calling it a day. I’ll probably be making this again next weekend when the forecast promises us another wave of springtime weather! Place all ingredients except water into a food processor or high-powered blender. Add water a bit at a time until you have a thick but pourable consistency. Heat olive oil in a large skillet over medium heat. Add shallots and cook until soft, about 5 minutes. Add garlic and cook another minute or two. Add the asparagus and chickpeas and cook for another 5 minutes over medium-high heat. Add the peach or nectarine and cook until liquid has been released and the whole mixture is bubbly. Season with salt and remove from heat. Wash and dry the lettuce, tearing it into bite-sized pieces. Toss with several tablespoons of edamame pesto (3 or so per serving should work), plate, and top with warm asparagus and peach mixture. * I added this post to this week’s Wellness Weekend, My Meatless Mondays, Fat Tuesday, Traditional Tuesday, Slightly Indulgent Tuesday, and Mix It Up Monday. This entry was posted in Uncategorized and tagged asparagus, edamame, gluten-free, healthy, pesto, recipes, salad, vegan, vegetarian by hännah. Bookmark the permalink. I live in Seattle and we got that same gorgeous sunshine last week. This salad looks great! I’ll have to give it a try! 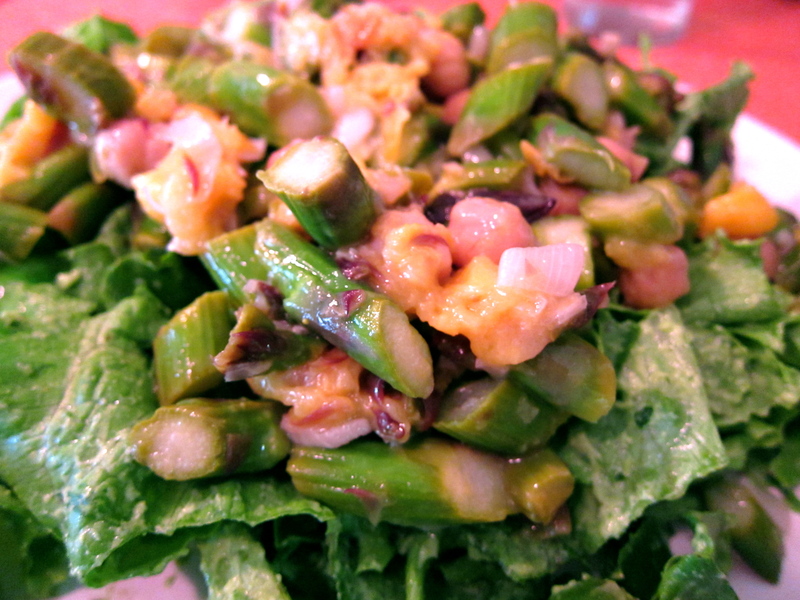 I love edamame beans… this is just a perfect Spring Salad. I would love if you shared this on my foodie friday linky today.